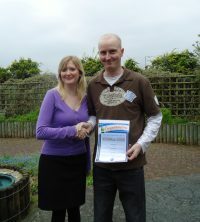 Matthew Allen was our winner for April 2012 because of his continuous dedication and hard work at Meadowside School in Wirral. Consultant Jennifer Morrison says that Matthew is a pleasure to work with and an excellent representative for New Directions Education. The decision was made to nominate Matthew from the outstanding feedback received from Julie Wilkinson at Meadowside who quotes “Matthew is one of the best temporary members of staff they have had”. Matthew received vouchers from a local music store to support his hobby as he is a member of a local band.